Dedicated to sharing the lessons of Nature to benefit the Planet and all her inhabitants. So many wild species struggle to survive in the face of human activity. Serious population declines over the last half century should instill fear in every human heart – we need these wild animals for our own survival. Humans, by-and-large, disdain insect and arachnid species, either fearing them or labeling them as pests. Reasons are, for the most part, based in ignorance of the value these animals provide. We call these ecosystem services and natural capital, functions rooted in Nature upon which Homo sapiens depend for our own lives. Some of these, like the water cycle, are obvious to us – although we still foolishly complain when it rains. Also trees often get lots of credit for their oxygen production, however, when allowed to form a forest, trees up the ante on the services and capital we rely upon – erosion and flood control, water purification, lumber and paper products, etc., etc. Insects, Spiders and other such animal species, however, do not get much credit for anything other than being “pesty”. When one considers the full web of life, it does not take long to realize that these invertebrates are critical to all life on Earth. I might even risk saying that they are second only to plants in importance, which explains why they vastly outnumber all other animal species. This 1st and 2nd place rating is no coincidence. Without plants, no animal eats – none of them. All food is based in the plant world – and many, many plants greatly depend upon insects in order to reproduce, be it through direct pollination services or the protection certain invertebrate species provide to plants. Consider that approximately 75% of flowering plants rely on animal pollinators to reproduce. Of the over 200,000 species of animals who perform pollination services, 99.5% of them are insects, such as beetles, bees, ants, wasps, butterflies, and moths, or spiders. Clearly we must educate ourselves on these essential animals. We need them or Homo sapiens becomes extinct. The factors that threaten invertebrates are far more than just fear and disdain. While we directly target some for annihilation with chemicals, others are being threatened by our use of resources – habitat loss, pollution (air/water/ chemical) and climate change being the top factors. And our best-loved insects, the Butterflies, are not immune to humans’ insatiable use and misuse of natural resources. A recent study states that the Monarch Butterfly, an icon of Nature’s beauty, may be only 20 years from extinction. Why? Habitat loss in both its Winter and Summering grounds (they Summer and reproduce in Western New York), pesticides, genetically modified crops and climate change are the reasons. And let’s think about those deva stating population numbers above. What is the link to the invertebrate world? Many of these animal populations feed upon invertebrates, be it the adults, larvae and/or eggs. Mosquitoes are a favorite food of both birds and freshwater animals. Is it any wonder there is a rise in Mosquito-borne disease recently? The interconnectivity of Nature is still a mystery and we need to understand these complex relationships as they relate to our own behaviors and use of the natural world. Become knowledgeable about insects and spiders. Learn what services they perform that eventually trickle down to our own survival. And remember, the vast majority of these species pose no harm to you. Put the chemicals and fly-swatters away. First, it is a losing battle – their numbers are too great and many evolve quickly to survive chemical applications. Instead, make sure your screens are tight and intact, turn off lights near windows and doors, use natural repellents (like citronella, cloves and lemon balm). Create wildlife habitat, especially for those native pollinators in peril. All of Nature will benefit – see http://oakmossed.com/garden.php for lots of information on environmentally sound gardening, native plants and our invertebrate friends. The future of Planet Earth is literally in our hands now. Our actions and failure to act will not only dictate the further existence of wild animals and plants, but our own existence, as well. There is a sweet tradition that holds the first bird sighted on New Year’s Day is your theme bird for the year, one which will share its lessons and inspire you both intellectually and spiritually. This year, the Tufted Titmouse (Parus bicolor) has taken on the role of Bird of the Yea r for me after an early morning sighting on January 1st. Personal experience has demonstrated that our fellow species, be they plant or animal, can teach us much about life and I look forward to learning more from the Tufted Titmouse as 2016 progresses. Below is some of the information I’ve gathered thus far and will continue to decipher how this small songbird will enrich my life with its presence. I’ll share these insights with you later in in the year. More known for its “peter-peter-peter” song than its appearance, the Tufted Titmouse is a small, jaunty passerine (5 to 6″) whose behaviors are interesting to observe. Males and females look alike, although some research suggests that the black forehead patch may be slightly larger on dominant males. Beyond that, one will have to spend some time in observation and listening as the males are the producers of the boisterous “peter” song while females are the primary nest sitters. Although an inquisitive species, Tufted Titmice are a bit less social with humans than their cousins the Black-capped Chickadee, who can be hand-fed after coaxing. Titmice form limited families in that young remain with their parents through the first Winter and sometimes help raise the next season’s brood. Male Titmice strongly defend their territories and their small Winter flocks have an “alpha” male of sorts who will drive off “alien” males who attempt to join the assembly. Being a woodland species, Tufted Titmice are less likely to take up residence in open field next boxes as they prefer not to fly across open spaces. The Tufted Titmouse uses tree cavities for both nesting and roosting. However, they do not excavate their own cavities but, instead, use existing ones. Use of nest boxes is mixed among birders who monitor them. “TT” raises one brood of 5 to 8 youngsters per season. They will include human hair in nest materials but it should be cropped short as longer strands may tangle around the legs of baby birds. Its range is moving northward, likely in conjunction with a changing climate. Although heard often in the woodlands, the Tufted Titmouse rarely visits my backyard feeders in Summer and is almost exclusively seen on the property after the formation of Winter flocks in late Autumn (which include Downy Woodpeckers, Black-capped Chickadees and Nuthatches). It is a non-migratory species. Can hang upside down on branches in search of arthropods hidden beneath bark. Find your own “Bird of the Year” and enjoy the many pleasures and wisdom of these feathered friends! UPDATE 9/5/13: On Wednesday, September 4th, the USFWS, under sharp rebuke for tainting the process of selecting members of the review panel, extended the public comment period on removal of Gray Wolves from ESA protection until October 28th. Please voice your support for retaining wolf protection through the link noted in the original posting below. For further information on the mishandling of the review panel selection process by the USFWS and the related delay on review of the delisting proposal. see http://www.latimes.com/news/science/sciencenow/la-sci-sn-wolf-delisting-on-hold-20130812,0,6991561.story. Original Posting: You have until October 28, 2013 to submit your comments to the USFWS in support of retaining Endangered Species protections for Gray Wolves (Canis lupus) in the contiguous 48 states. Pressure to remove this protection is entirely political with a vast number of wildlife biologists in opposition to delisting. Why keep the protections in place? The short video below tells it all. To submit your comment, please visit: http://www.regulations.gov/#!docketDetail;D=FWS-HQ-ES-2013-0073. The wolves and ecosystems thank you. 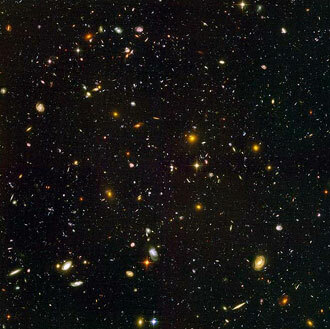 View deep into the Universe from the Hubble space telescope (1995, 1998). (Thanks to the Burchfield Penney Art Center, Buffalo NY, for continually unearthing the incredible wisdom of Charles Burchfield, talented artist and naturalist). A recent article on the definition of ecosystem services sparked quite a debate among its commentators. There seemed to be disagreement on exactly what it truly means: some definitions are quite simplistic (e.g. claiming a simple resource, such as iron, fits the bill); others see it only from a human perspective. At the same time, some respondents applied ethics, tying it up with human conservation management/engineering. Personally I found many of the arguments disturbing, considering they were coming (supposedly) from educated people in the scientific realm. But, then, sometimes it seems that scientists can suffer from tunnel vision due to specialization. Being a student of both environmental science and ecology requires a more comprehensive view of this world encompassing many of the sciences out there. In my work, students are taught that an ecosystem service is a “network” of behaviors and or processes that, combined, provide important, if not necessary, functions for an ecosystem. It’s simplistic but since there are numerous such processes in place, it’s best to start humbly and get more detailed with specific examples. Can we humans benefit from ecosystem services? Certainly! But it is important to remember that such processes were in place billions of years before mammals were abiding on Earth, much less Homo sapiens, and do not function merely for human purposes. Birds provide an excellent example of ecosystem services at work. While most of us are always conscious of their existence, the benefits they provide directly to ecosystems (and as a byproduct, to humans), is often overlooked. The simple pleasure of harvesting wild black raspberries this past weekend reminded me of yet another benefit provided by our avian friends. Fourteen years ago I purchased my current home and property. It had two habitats, half for human use (house, lawn, neat rows of conifers, etc.) and a “wild” half, mostly left intact simply because it is too wet to be of much human use, although it was once a grazing field for Black Angus raised by the neighbors. By the time I moved in, the Angus were long gone and since then the wet meadow has increased in size while still leaving a substantial human habitat of ~1/3 acre. One aspect of yard work I’ve always despised is the idea of trimming beneath trees so that lawn (or mulch) goes right up to the trunk. My philosophy is to mow as close as you can and let the rest be. And in areas for which there are no plans to garden or walk about much, leaves, twigs and what-not are allowed to drop and decay. This non-practice creates the conditions that alone allow to go forth the ecosystem service provided by trees, insects, decomposers and detritivores – adding important nutrients and creating more soil. And in these areas where soil supplementation is allowed to take place, the birds step in and add another. 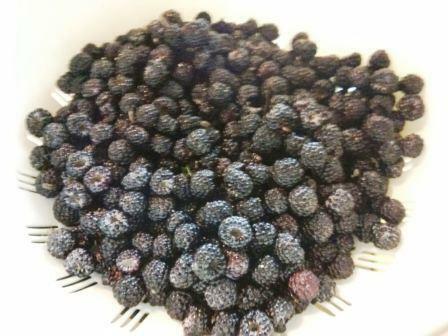 First harvest of wild black raspberries (Rubus occidentalis) – 2 pounds and counting with plenty left for the Gray Catbirds! Birds are among many animals that provide the ecosystem service of seed dispersal. Plants are all about reproduction and through evolutionary processes, numerous vectors of seed dispersal have come about. One such method includes plants putting enormous stores of energy into fruit production. This serves only to entice other creatures to eat it, taking the seed away from the parent potentially to be germinated. Other vectors include wind, rain, burrs, etc., but fruit production provides such a far-reaching and overlapping service to an ecosystem by also provisioning food. And those who eat the food are part of the entire process. So, GASP, even humans can be naturally implicit in an ecosystem service. Who would’ve thought! It’s not the first time I’ve pondered and written on this subject. However, recent events here in the Buffalo area have resurrected the conversation on animal cruelty. Two separate cases of cruelty to domesticated pets (one puppy and one kitten) and the subsequent movement to pass more stringent punishments for such offenders have been all over local media (see story links below). Interviews with law enforcement officials and animal welfare experts express the contention that the purposeful injury of an animal indicates mental health issues that can lead to criminal behavior extending to humans. No argument here. But WHY are these same considerations not extended to wild animals? 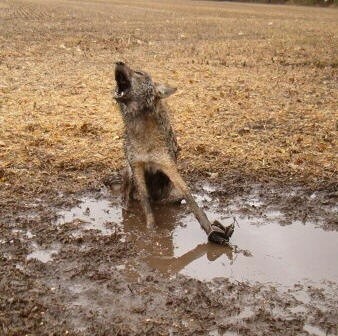 We legally allow painful and cruel trapping every single day. Where is the scientific evidence that wild animals feel any less pain or psychological trauma than domesticated animals? And WHY are animals raised for food (although protected better than wild animals) subject to treatment not allowed to pets? People get arrested for housing too many dogs and cats. 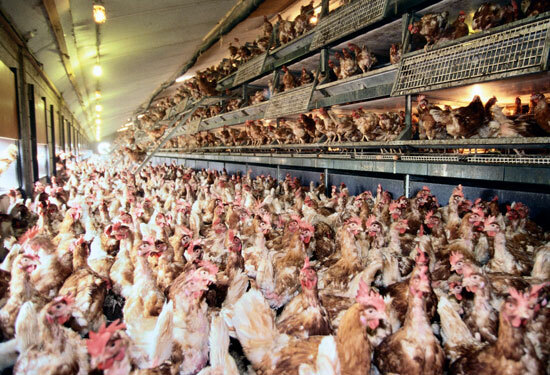 Why can we crowd domestic farm animals in horribly small and filthy spaces? What scientific evidence exists that animals raised for food feel less discomfort than a dog or a cat? Yes, I am ranting because the capacity for humans to disregard groups of beings and categorize them as requiring less respect is an obscenely ignorant behavior. What the puppy Phoenix experienced was horrible and the death of the kicked kitten, appalling. Yet the treatment that is associated with the photos and video below of wild and farm animals is LEGAL (and in some states a constitutional right). WHY, WHY, WHY? PLEASE NOTE – these stories and images may be disturbing to sensitive individuals. At Oakmoss Education we work to bring individuals back in connection with the natural world. Although modern society offers many advantages, in the process of becoming more "civilized", the human species has distanced itself from the very source of life. This separation has also caused the environment and our fellow species to suffer greatly. Our hope is to re-awake that intuitive connection so that the rewards of deeper wisdom and healthy, fulfilling lives can be realized for all earthly inhabitants.